then triangle is a right triangle right angled at . 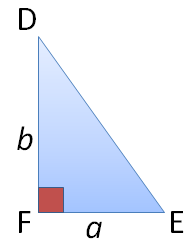 This means that in order to prove the converse of the Pythagorean Theorem, we need to prove that in the figure above is a right angle. Now, we discuss the proof. then is a right triangle with a right angle at . This means that length of the three corresponding pairs of sides of triangle and triangle are equal. Therefore, by SSS Congruence, . 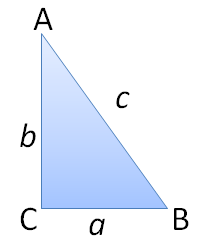 Since and are corresponding angles, degrees. * Note that in the proof, is the opposite of angle , is the opposite of angle , and is the opposite side of angle .